Charger Robotics earns 5th Chairman’s Award, qualifies for championship competition in St. Louis - Hamilton School District. Charger Robotics Team 537 came away with two significant team successes March 25 at the FIRST (For Inspiration and Recognition of Science and Technology ) Robotics Wisconsin Regional Competition held at the University of Wisconsin – Milwaukee Panther Arena. For the fifth time in six years, the Hamilton team earned the regional Chairman’s Award, the most prestigious team award that supersedes winning the competition itself. In addition, the team qualified for World Championships in St. Louis April 27-30 where it will give its Chairman’s presentation and the team will compete using its robot, Brik. The Chairman’s Award was created to recognize teams that demonstrate the greatest commitment to spreading passion about science and technology in their communities and schools. Team members submit an essay, a three-minute video and give a presentation in front of a panel of judges. Seniors Drew Coe, Erin Heaster and Carl Swartzendruber presented. The award was earned in part because of senior Jake Myatt’s role in reaching out to government officials who attended Robotics events and authored a state bill to fund high school robotics teams. Charger Robotics team members were invited to attend the Capitol and lobby the senate committee on education to support the bill which was signed into law March 25 at the Wisconsin Regional competition. The bill ensures that $250,000 in general purpose revenue is used to fund grants so that eligible high-school teams can participate in robotics competitions like the FIRST Robotics Wisconsin Regional Competition. 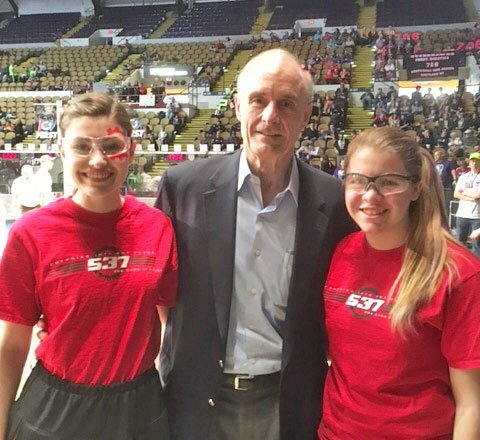 In addition to the team success, Hamilton senior Erin Heaster and sophomore Caitlin Bolz were selected to provide a tour of the event to Rockwell Automation’s CEO Keith Nosbusch. The students gave a game summary and shared their experiences with FIRST which engages students in competition with robots designed and built by high school students.